#123576 at North Freedom, April 2000. C&NW eastbound freight near Boone, IA, Sept. 27, 1935; Fowler car behind engine. Otto Perry Photo, Denver Public Library, Paul Swanson collection. During 1914-15, just before WWI, the Chicago & North Western took delivery of a large fleet of “Fowler” patent outside-braced wooden boxcars. 7,000 cars were lettered for the C&NW while another 1,500 were assigned to C&NW-subsidiary Chicago St. Paul Minneapolis & Omaha. The order was split between four builders: Pullman, American Car & Foundry, Western Steel Car & Foundry, and Haskel & Barker Car Company. 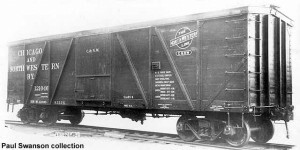 The Fowler design was an early single-sheathed boxcar body, economical to build and very durable in service. The underframe was steel, providing a much stronger structure than previous wood designs. The single-sheathed design was used profusely for many years. At the end of WWII, nearly 80% of C&NW’s Fowler fleet was still in service. But with the booming 1950’s came a flood of new steel cars to replace C&NW’s aging boxcar fleet. Wooden equipment was quickly replaced; by the 1970’s most were retired. #123576 was built by AC&F in Detroit as part of Lot #7451, numbering 3,000 cars. C&NW used the outside-braced boxcar chiefly for hauling grain, and as such, #123576 most likely spent most its active career carrying corn, wheat, barley, and other grains across the North Western’s vast system. At an known date, #123576 was purchased by equipment dealer W.H. Knapp and eventually ended up at Circus World Museum at Baraboo, Wisconsin. 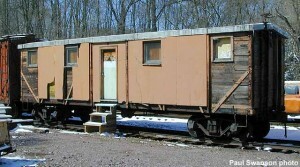 In 1989, the car was sold to a Mid-Continent member, moved to North Freedom, and leased to the museum for storage. Someday perhaps, #123576 can once again wear C&NW’s ball-and-bar emblem and haul corn from the Baraboo valley. Like many of the midwest granger roads, the Chicago & North Western Railway was formed with the consolidation of smaller lines and quickly expanded. C&NW was organized in 1859 by joint acts of the Illinois and Wisconsin state legislatures to comprise a main trunk route running northwest from Chicago to Janesville, Wisconsin and on to Green Bay. 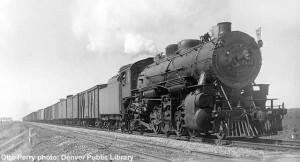 In 1864, the pioneering Galena & Chicago Union was merged, and the C&NW was on its way to becoming a major link in the east-west transcontinental between Chicago and Council Bluffs, Iowa where it connected with the Union Pacific. By the turn of the century, C&NW reached seven states with over 5,000 miles of track. After the depression, prudent management kept the company successful by pruning unprofitable lines and long-distance passenger trains. C&NW soon merged several competitors to strengthen its traffic base, including M&StL in 1959, Chicago Great Western in 1968, and the Rock Island’s Minneapolis-Kansas City route in 1980. In 1995, C&NW succumbed itself when it folded into the Union Pacific. Mid-Continent’s ties with C&NW heritage are extensive: ex-C&NW steam locomotive #1385 traveled the North Western’s system extensively in the 1980’s, serving as its “goodwill ambassador,” and Mid-Continent’s rail line was purchased from the C&NW in 1963, allowing the museum to move to its present site. The American Car & Foundry Co., of Jeffersonville, Indiana had its beginnings as the Ohio Falls Car Co., being established during the Civil War. Ohio Falls endured several bankruptcies and the Panic of 1873 to become a major Midwestern car builder. Early on the firm promoted use of Southern Yellow pine for car construction due to its superior strength. By the 1890’s Ohio Falls’ volume had reached $3 million worth of cars annually. In 1899 Ohio Falls was consolidated into the industry giant American Car & Foundry Co. (AC&F). The Jeffersonville plant was closed by AC&F in 1945 although most of the buildings survive, utilized for a variety of industrial and commercial purposes.